When we first heard about the Environmental Protection Agency (EPA) new Rules for Lead Paint, we remembered that in 2007, one of our sales representative was at St. Mary’s Church, in Holliston-MA, discussing with Father Mark about the challenge and issues in dealing with lead paint on the siding, on the tower and other areas of the Church. Back in 2007, to get any Lead Paint job done, it was not needed to be a Lead Paint Certified Contractor. Some painting procedures were not even considered to be an issue by the way they were done. Procedures such as: how to set up the areas to be painted, how to strip the lead paint, how to collect the dust and chips from the stripped lead painted area, were done with no difference from a regular paint job. Today, they all have a newer and safer approach. Now, in 2011, that we see how the EPA enforces the new Lead Paint Regulation. So, we take pride and feel very good about our company because when the painting project on St. Mary’s Church was awarded to us, in 2007, we actually used our “common sense”. What we are trying to say is that we called the Department of Labor Division of Occupational Safety – OSHA and we shared with it our intention in how to perform a Lead Paint removal at Saint Mary’s Church, and how important it was for us keep the Church clean, in regular daily basis, and how seriously concerned we were in keeping the environment Lead Paint free. 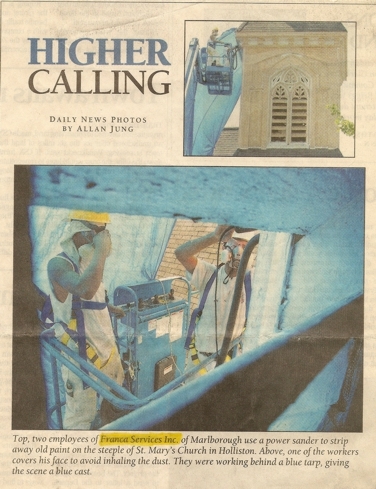 featured on the Holliston MA Local Newspaper while doing Saint Mary's Church painting project. To get the church job done, after contacting the OSHA department, we met Mrs. Tyson, who was very helpful and guided us through the entire process, from the beginning to the very end. With the help from the OSHA Department, we were able to come up with a safety program that includes the job site preparation, workers safety, specific safety equipments and tools that control dust and debris, and also special disposal container for Lead Paint. We accomplished our goals, keeping the church clean and the environment safe. And what made lots of difference was that Mrs. Tyson actually came to the site a few times to check how things were being handled. Now, four years later, EPA enforces the new Lead Paint Rules, exactly the way we had the church done at that time. What you need to know is that when you have a painting contractor stripping the Lead Paint from your house or building, the contractor must control the dusty and debris from doing it , there is more details that need to be addressed in order to comply with EPA. If you would like to know how to protect your kids and other members of your family, and the details about the new EPA Lead Paint Rules, you can download THE LEAD-SAFE CERTIFIED GUIDE TO RENOVATE RIGHT. It will help you understand how serious Lead Paint need to be addressed. Stay tuned for our next blog, we will talk about VOC paints.